Harrah’s Hotel has all the facilities of a big Vegas hotel. Accommodation is taken care of with 2500 rooms and suites offering a good choice, ranging from classically well-appointed to the ultra luxurious. Of course, with such a great location, the views of the strip are superb. If you’re in town for business, Harrah’s Hotel works hard to make it a great experience. Meetings from small to mid-size are the speciality. All your needs are taken care of under one roof: stay, meet, eat and play. There is full technical, communication and service backup for everything from a small meeting to an all-singing, all-dancing product launch for 1300 guests. 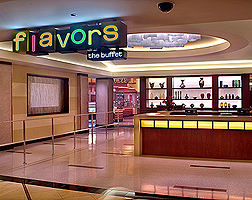 For a real touch of Vegas magic, entertainment venues like the Improv Theatre or Carnaval Court can turn on the charms. The Spa at Harrah’s will take care of rejuvenating body and soul. Relax and enjoy a Swedish massage, aromatherapy, facials and so much more. Plus, you can look your very best after a visit to the hotel’s full-service beauty salon. The state-of-the-art health club on the 4th floor of the Carnaval Tower will put you through your paces. Finish off your workout with a couple of laps of the health club’s Olympic-sized swimming pool. A relaxation session in the steam rooms, whirlpools or sauna is another option to unwind. Golfers have access to two courses nearby. Of course, you’ll also want to play the odds, so rest assured the 86 thousand square foot of casino space has every way to play. 24/7, there’s everything from blackjacks to slots, sports to keno. Entertainment happens around every corner here, like a piano bar, karaoke club, comedy improv, magic shows, ‘Elvis’ and the longest-running celebrity tribute show in the world! After you’ve worked up an appetite, the options range from a great steakhouse to Asian cuisine, big buffet world cuisine to seafood specialities. Plus, many more casual and light bites. Of course, there’s also a Starbucks. Bars are never far away either, with a range that caters for all tastes and moods.